"I am a Republican, and I love Amy," said Shelly Plunkett, who lives in Minneapolis. "She's one of those leaders that can cross the aisle and get things done. I am so excited, and she's a fabulous woman I can get behind." "I find her to be the most hawkish of any Democrat in Congress," said Mike Madden, a St. Paul, Minnesota resident who was with a group of anti-war protesters railing against Klobuchar’s candidacy. Klobuchar is now perhaps the most moderate candidate in the Democratic field—although the New York Times has called her "hardly a centrist"—as most of those who have already declared their candidacy have reinvented themselves as even further to the left than they have been in the past. Klobuchar also carries Midwestern roots, which may help her early on in the Democratic primary battle. However, that advantage could be undercut by Sen. Sherrod Brown (D., Ohio) if he were to enter the race. Brown has been taking his message on the road in recent weeks during his "Dignity of Work" tour. Klobuchar, who portrays herself as "Minnesota Nice" in public settings, made her announcement on the heels of reports that she has mistreated her staff for years. Klobuchar's actions allegedly date back at least a decade, well before she made her way to Washington. The Huffington Post and BuzzFeed both reported this week that the Democratic senator is prone to fits of rage and is "habitually demeaning and prone to bursts of cruelty." On one occasion, a staffer was inadvertently hit in the head with a binder after Klobuchar lost her temper and began throwing objects. Klobuchar's behavior, which has been an open secret on Capitol Hill for years, led former Sen. Harry Reid to rebuke her in 2015. 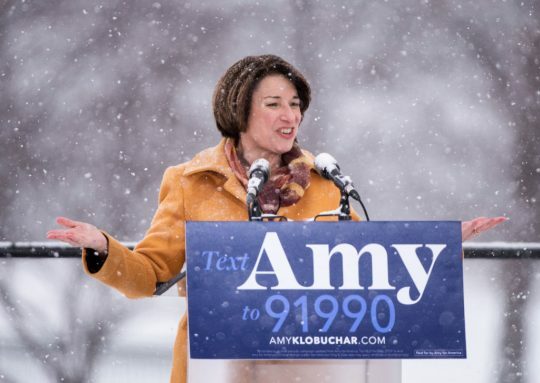 Klobuchar's reputation has also allegedly made it difficult to recruit aides for her campaign. Klobuchar for years has had the highest staff turnover rates in the Senate. Other staffers have defended Klobuchar's leadership style. "It's a very unfortunate way to start a presidential campaign," Iowa Democratic strategist Jerry Crawford told Politico. "It was well-known at the insider level, but now it’s becoming well-known to the general public at the time she’s announcing, which is problematic for her politically."